Do you ever have the feeling that someone is ‘walking all over’ you? Do you find yourself frustrated or even a bit cynical with others and hear yourself saying ‘they made me/want me to/expect me to…’? I hear that quite often as new clients work with me in coaching. What they soon discover is they have been remiss to set boundaries. Once we uncover what might be getting in the way and exactly what a boundary might look like, the activity revolves around becoming clear about their ‘line in the sand’. Let’s talk a moment about what is a boundary. 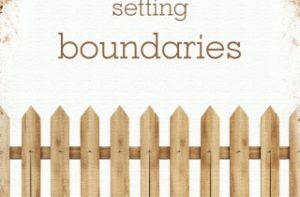 According to Merriam-Webster, a boundary is: something that indicates or fixes a limit or extent; a real or imaginary point beyond which a person or thing cannot go. When we look at boundaries as a fix to ensure or support self-care rather than selfish-behavior, we can be guilt-free when we say ‘no’; we can ask for what we want and need ; we can say ‘yes’ because it is what we want to say rather than feeling it is the obligatory response. Boundaries support our desire to ‘be’ who we are, really, and not who other’s expect/want/need us to be for them. Several comments I often hear regarding this awareness is this: I can’t be that mean and say no all the time; doing that would be like slamming the door on this relationship; if I don’t give in to him/her, they won’t like me anymore. And so it goes – the excuses, justification and rationalization as to why setting boundaries won’t work! And here is a question that might be something to ponder upon: What might your life look like if you took responsibility for your own happiness and success? What would that be like for you? Boundaries do not have to be impermeable walls! They can be, and possibly should be in some instances; however, they can also be like the orange construction fences that have some flow through and some give. They can be like picket fences that are sturdy and strong with areas of drifting through. Is it possible to have ‘both/and’? Of course, in many instances, it is! The focus here is that one does intentionally create that line in the sand and determine if the situation at hand is a brick wall or construction fence!